Maccaferri Balkans is the main supplier in this major project in Albania. Maccaferri Balkans is currently involved in a new major project in Tirana, Albania, requiring hydraulic works and soil reinforcement applications. 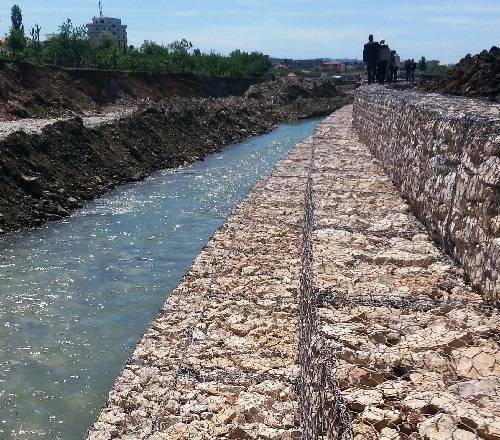 Known as Tirana’s Northern Boulevard & River Project (TNBRP)”, this environmental project carries the Maccaferri name as mattresses and gabions being used all across all the longitudinal line of the river are from our Company. And a little farther, where the land is limited, you can find our Green Terramesh Light product, which is giving the slope the desired architecture from the surrounding landscape as well as the required stability. Financed by the Municipality of Tirana, this project was designed by Italy’s Studio Associato MPM. In total, to carry out this project, large stocks of Maccaferri products were deployed as follows: 19,000 square meters of Reno Mattresses, 28,750 cubic meters of 2x1x1m Gabions and light Green Terramesh made of 5x3x0.73 elements for a total of 1,600 square meters. The project is about creating a new lively downtown area along the northern extension of Tirana Central Boulevard in a green avenue running through the city center between the two main parks: the existing Parku I Liqenit in the South and the Parku I Paskuqanit in the North, to be built in the future. The project involves the construction of a riverbank accommodation along 7 km of Tirana River, the construction of a large central square, upon the junction of the boulevard on the Tirana River. So far, the usage of gabions resulted in both serving as a river protection and erosion control solution for the inhabited valley of the river and giving also the area a beautiful landscape. From the beginning of the project, Maccaferri Balkans has been in contact with the contractor company, Trema Engineering 2 shpk which, after a long time using our products, has earned confidence with the benefits of our products and with their installation. Works are in still in progress and it is assumed that the project will be concluded in autumn. We will come back again soon with more news. In the meantime, to learn more about our hydraulic works and soil reinforcement applications, please do not hesitate to contact our albanian Subsidiary.